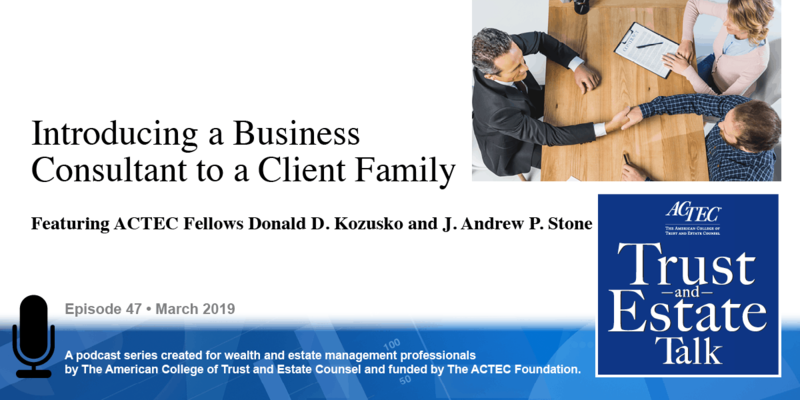 “Some Hot Topics for Trust and Estates Practitioners,” that’s the subject of today’s ACTEC Trust and Estate talk. This is Susan Snyder, ACTEC Fellow from Chicago. 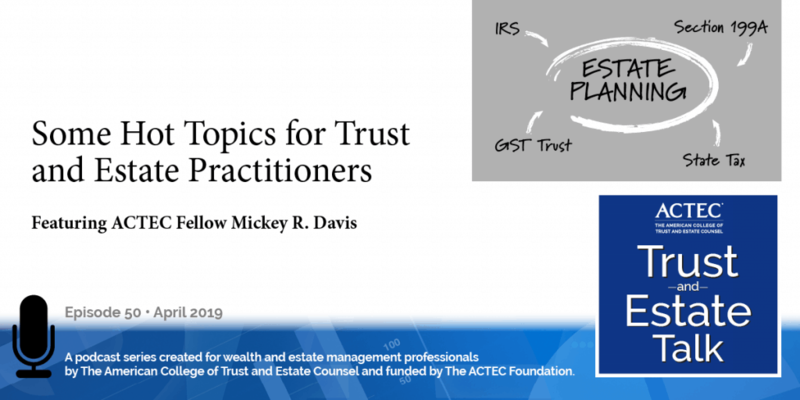 Today you will be hearing from ACTEC Fellow Mickey Davis of Houston, Texas on some hot topics in the area of trust and estates. Welcome, Mickey. Thanks, Susan, I appreciate it. There are just a tremendous number of hot topics to talk about this year. If you’ve been attending seminars you’ve been hearing some of these and I’m just going to recap some highlights for you. We know the IRS just issued their Anti-Clawback Regulations which Congress directed them to do. Remember, that issue is if I make a 10 million dollar gift when the exemption is high and die when the exemption is low, do I end up owing more estate tax? If you read the statute, if you read the way the adjusted taxable gift computation works, you probably do. Congress was aware of that, they asked the IRS to write some regulations to fix it, which the IRS actually did. And the gist of it is if you use a large basic exclusion amount during your lifetime, and you die when the basic exclusion amount is lower, you get to actually use the lifetime used basic exclusion amount. So if you did make that 10 million dollar gift, you died when the basic exclusion amount was six million for everyone else, your basic exclusion amount would be 10 million and it avoids that clawback problem that everyone is worried about. The other big regulatory change from the IRS here is the Section 199A regulations. As you guys know, this is a part of tax simplification. We get one statute that’s only going to last for eight years that is 4,400 words long and if the statute weren’t enough, the IRS had to tell us what it means with 100+ page regulations. They issued proposed regulations in August, they had a lot of problems in those regulations, which ACTEC and others pointed out to the IRS. Fortunately, the IRS listened, they issued final regulations in January of this year. They did a good job of fixing a lot of the things we were particularly worried about including issues with the multiple trust rules, with family attribution, with how basis is measured – if I take the assets that are in my proprietorship and transfer them over into my S-corporation or partnership – so the regulations are much improved. My wife and law partner, Melissa Davis, has a detailed paper she presented at Heckerling and she has since updated that paper for the final regulations. ACTEC can provide a link to the paper as well (Getting the 411 on IRC 199A: Just the Facts, Ma’am). There have been several private letter rulings on GST Trust Modifications. Those are all really interesting things. People are modifying trusts, they’re decanting, they’re dividing, and you’re always worried on a zero-inclusion ratio trust – if you’re busting a GST election, lots of PLRs on that issue, but I don’t really have time to go into details on those today. Again, if you attended the Heckerling conference, there’s a great summary of those in their hot topics presentation. Some interesting developments in the state tax arena. Now, we Texans don’t think about state income tax for trusts because we don’t have a state income tax in Texas, but we need to worry about it and so does everyone else. And the reason is because states have this notion that they can tax a trust not based upon where your client lives but where the trustee lives, where the trust property is, or even where a trust beneficiary resides. Well the Kaestner case is a North Carolina case where the North Carolina Supreme Court just decided that the residence of a beneficiary alone is not a sufficiently close connection to the state to permit the state to tax the trust. The North Carolina Revenue Department wasn’t very happy about that, they appealed the ruling to the US Supreme Court and the US Supreme Court has agreed to hear the case. There will be oral arguments on that case on, of all days, April 15th, so we’ll get to see how those state nexus rules work. Of course, last year many of you know that the US Supreme Court issued the Wayfair decision, which changed the way states can tax businesses. They’ve thrown out the physical presence test that was in the old Quill opinion, mainly due to the fact so many people are doing business via e-commerce. Well will e-commerce changes translate over to the trust and estate world? We’ll have to stay tuned and see what the Supreme Court tells us. There’s another similar case to this, called the Fielding case out of Minnesota. 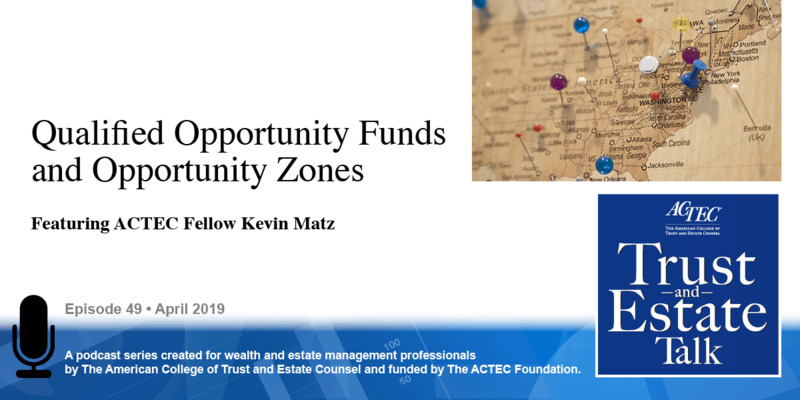 The only nexus was the residence of the grantor to Minnesota, and the “grantor connections” said the Minnesota Supreme Court, that by itself not sufficient to justify state income tax. So a lot of developments in this arena. Also on the state tax front, what happens if you die in state one, you make a QTIP election in that state, and your spouse moves to state two? When the second spouse dies can the state tax that QTIP property? No they can’t, says The Supreme Court in Maryland, where the taxing jurisdiction was Michigan. 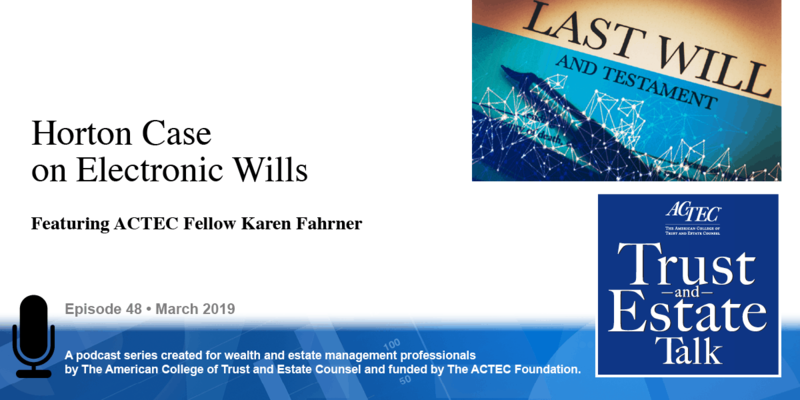 The husband’s estate made a QTIP election for federal tax purposes and made a QTIP election for Michigan state inheritance tax purposes, but the court said there is no Maryland QTIP election so Maryland can’t tax the trust when the spouse dies. Similarly, in the New York Seiden case, there everything happened in New York but at the time the first spouse died they made a federal QTIP election, excuse me, they made a state-only QTIP election in New York but didn’t make a federal QTIP election. When the spouse died, New York’s estate tax was based upon her federal taxable estate. Well there was no federal QTIP election, that trust was not included in her taxable estate, so even though state taxes were saved when the husband died the court said the QTIP trust avoided New York inheritance tax. I understand the legislators in New York are scrambling to fix that statue to make sure that they can change that result. 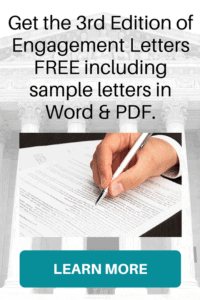 In a similar case, called Shire, where the beneficiaries sought to change the trust, the ad litem, who was appointed to represent the unknown heirs, (not surprisingly) objected – I don’t see how you could consent to such a change – and the court, acting to try to protect the unknown, unascertained beneficiaries refused to allow the parties to modify the trust by agreement. So, that’s a quick recap of some hot topics that we’re picking up here in March of 2019. And, as always, when we’re listening for hot topics stay tuned for future developments, thanks a lot. Thank you, Mickey, for your thoughts on recent developments in our area.